Here at Bromley Cross Opticians we are passionate about excellent eyecare. We believe that good eyesight is of paramount importance and it is the most precious of all our senses. Our experienced, qualiﬁed Optician Phil Kynaston BSc. (Hons) MCOptom provides thorough eye tests and contact lens checks using state of the art clinical equipment. This technology aids the early detection and treatment of eye conditions such as cataracts, glaucoma and age related macula degeneration and diabetic retinopathy. You can rest assured that you will be in safe hands as Phil has amassed a vast amount of experience over the last 20 years & has honed his skills in the independent, multiple and the hospital eye service sectors of the optometry industry. Phil is registered with The General Optical Council and is a member of The College Of Optometrists. He will use his skills and knowledge to ensure that your eyes are healthy and your vision is as clear as possible. We believe that seeing the same Optician at each eye visit will help to build a relationship of trust and deliver a more comprehensive visual assessment for you. We provide private and NHS sight tests and contact lens services in our ground ﬂoor, air conditioned clinic. We believe that it is essential for the local community to have access to high quality, convenient eyecare, so upon every visit we offer to discuss your individual needs, examine your eyes thoroughly using the latest modern equipment, answer any questions you may have and suggest visual solutions to suit you. Our eye examinations usually last around 30 minutes and we will advise you if you require any extra speciﬁc tests. We accept Duncan & Todd, Ice and Edenred eyecare vouchers. Children enjoy getting their eyes tested at Bromley Cross Opticians because we make it enjoyable & fun! It’s easy to assume that our children can see well but unfortunately not all children can often affecting their development, education and conﬁdence. It is advisable to get your children checked at around 4 to 5 years of age before starting school and then every year, until they are 16. Remember eye tests are free for children under 16 years or 19 years if in full time education. We strive to make sight tests for children fun and interesting and we may even show your children some of our optical illusions! We will build a rapport with your child to make them feel as comfortable as possible. Every member of our team is a parent and it is our ethos to care for your little one’s in the same way that we would like our own to be treated. Our test chart has shapes, numbers and letters to assess the visual function of your child’s eyes. We will also check that their eyes are working together properly and that they can distinguish colours. 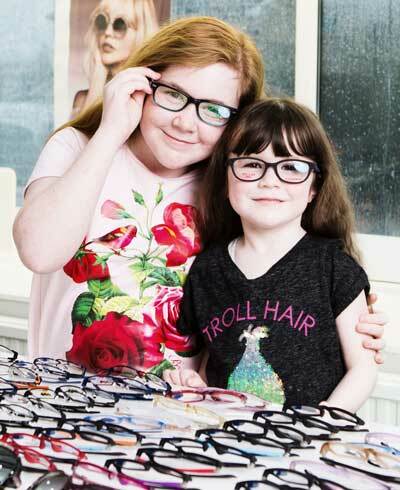 Most children do not need spectacles, but if your child does you can rely on us to provide great advice on what glasses will be best for your child. We carry a larger than normal range of children’s glasses so we are conﬁdent that your child will leave feeling happy about wearing their specs and be ready to take on the world!